A soft, green apple scented Chardonnay which demonstrates its unoaked nature with plenty of fruit on the palate. Whilst the grapes are grown in the relatively hot climate of southern France, modern production techniques have ensured this wine has a lively refreshing finish. In the past New Zealand Merlot (pronounced Mare-LOW) was mainly grown as a blending variety, predominantly with Cabernet Sauvignon dating back to the mid-1800s. The blending of the two varietals, Cabernet Sauvignon structure and delicacy and Merlot lively ripe fruit, create elegant, yet powerfully intense, red wine blends. However, New Zealand Merlot is now recognised as a premium variety, its popularity is due to its softness, fruitier richness, plumpness and earlier-maturing. New Zealand’s cool climate and lengthy ripening season allows Merlot to slowly grow and concentrate its flavours. About 75% of New Zealand Merlot is grown in the North Island wine regions, namely Northland, Auckland, Gisborne and Hawkes Bay with the balance grown in Marlborough wine region. 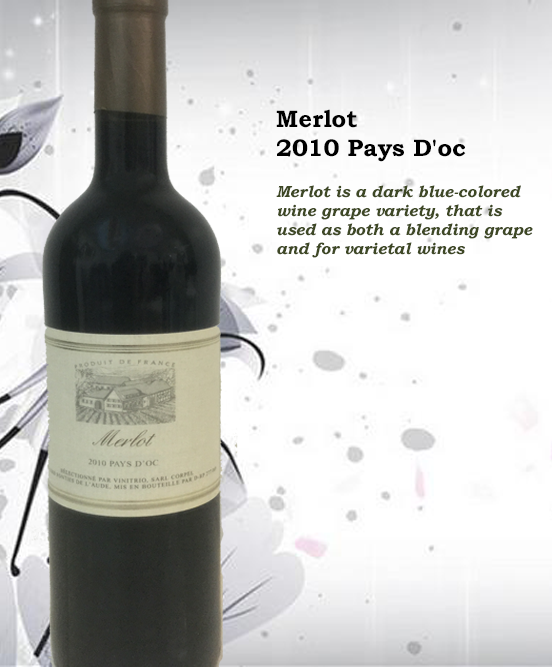 Along with Cabernet Sauvignon, Cabernet Franc, Malbec and Petit Verdot, Merlot is one of the primary grapes used in Bordeaux wine, and it is the most widely planted grape in the Bordeaux wine regions. 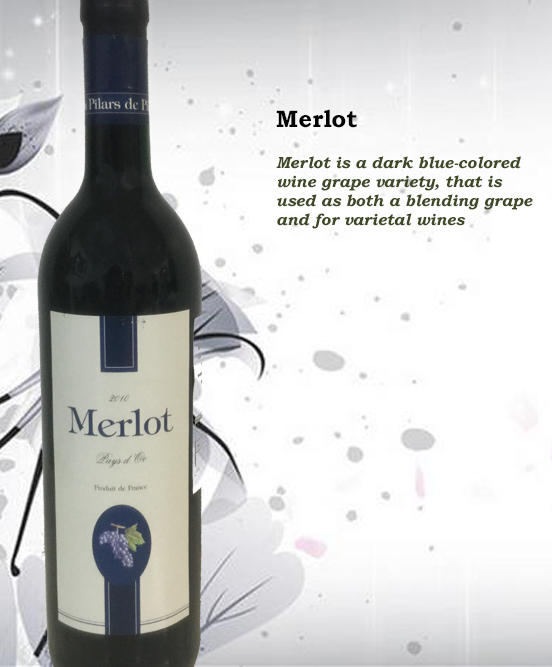 Merlot is also one of the most popular red wine varietals in many markets. This flexibility has helped to make it one of the world's most planted grape varieties. As of 2004, Merlot was estimated to be the third most grown variety at 260,000 hectares (640,000 acres) globally, with an increasing trend. This puts Merlot just behind Cabernet Sauvignon's 262,000 hectares (650,000 acres). 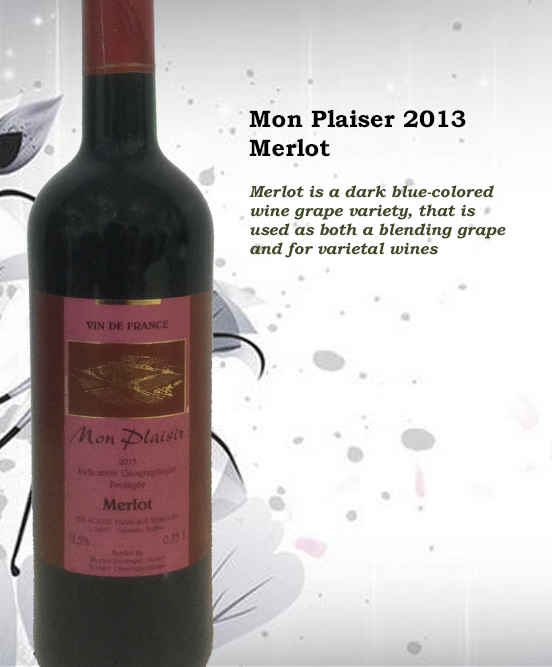 While Merlot is made across the globe, there tends to be two main styles. The "International style" favored by many New World wine regions tends to emphasize late harvesting to gain physiological ripeness and produce inky, purple colored wines that are full in body with high alcohol and lush, velvety tannins with intense, plum and blackberry fruit. 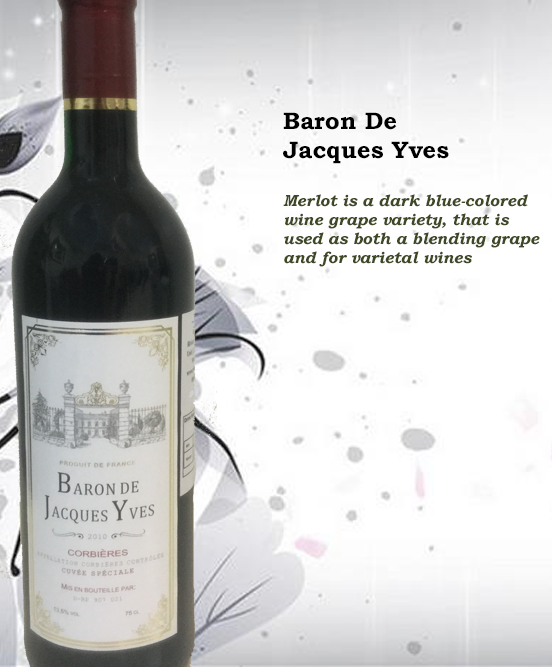 While this international style is practiced by many Bordeaux wine producers, the traditional "Bordeaux style" of Merlot involves harvesting Merlot earlier to maintain acidity and producing more medium-bodied wines with moderate alcohol levels that have fresh, red fruit flavors (raspberries, strawberries) and potentially leafy, vegetal notes. 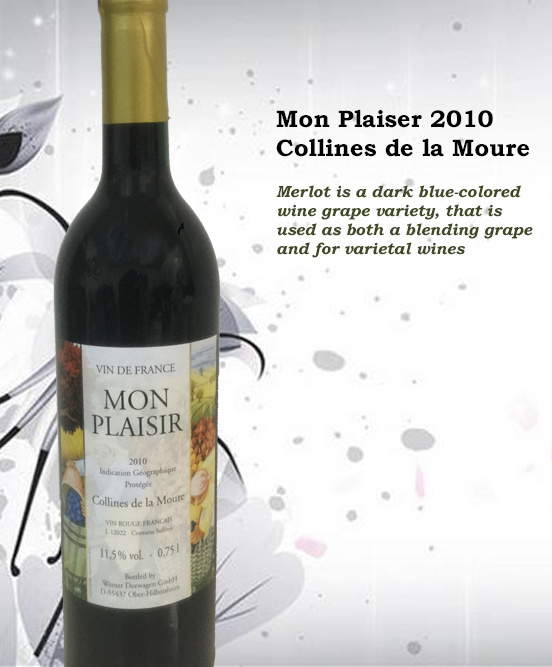 True to its name, the wine is indeed a pleasure: intense and perfumed.Mon Plaisir 2013 displays an exquisite bouquet of lemoncream, fresh butter and candied grapefruit, with subtle notes ofspring flowers. The palate is rich, full-bodied and creamy withbeautiful hints of fresh lemons, pear, grapefruit, jasmine, Mirabelle,vanilla, whole nut and brioche. 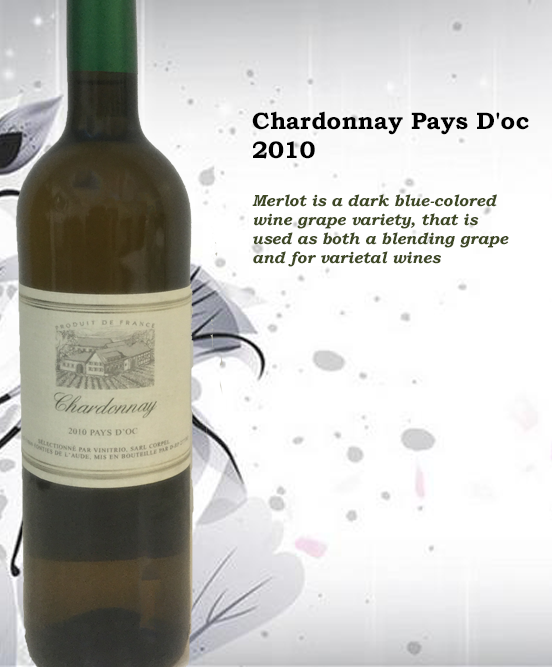 A mineral character withhints of pain grillé and hazelnut complete the mouth feel of thiswine and its long finish. Enjoyable now, it will age for a decadeand more. “For these lovely regional wines, we look for fruit, freshness and accessibility; these are wines that have been blended, in other words a combination of grape varieties chosen for their expression and their aromatic palette but also for their roundness in the mouth. 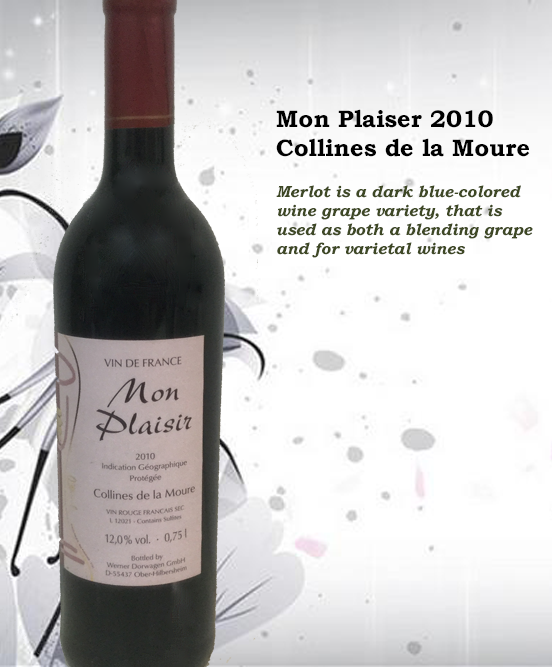 We work them in such a way as to extract the desired aromas, while retaining the pleasure in the mouth.” These local wines come from a vineyard with a charming name “Les Collines de la Moure” (“The Hills of la Moure”) located between Montpellier and Mèze. La Moure or “Lo Morrau” in Occitan, which means muzzle with the sense here of “rounded hillock”, denotes the Mediterranean shore which was once bordered by gently sloping hills. 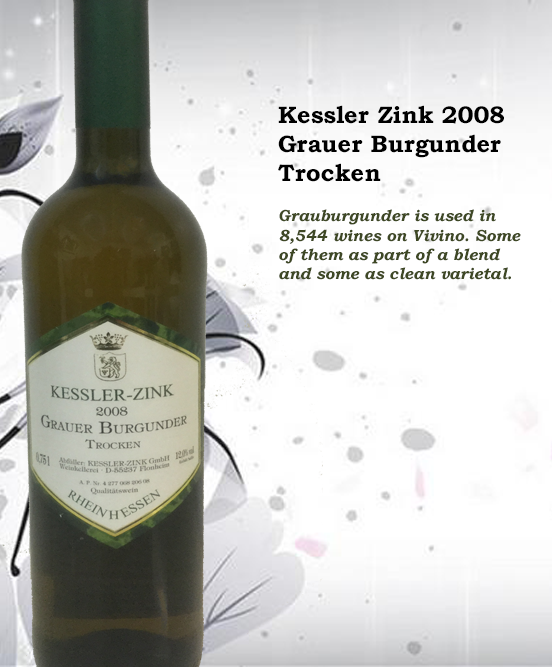 This unique terroir enjoys the beneficial influence of the nearby Mediterranean, allowing slow and well-balanced ripening of the grapes.